Not entirely sure why, but there is something about the new year that triggers efforts to get my life in order. I figure I'm not alone here. I'm guessing it's the fresh start thing. It's such a huge task, so I decided to start with one little corner of my world. A real mess. When it's distressed like this, I don't even want to work there. Found this little organizer at Joann's. Works perfect for buttons, do-dads and all my ink pads. I'm super happy with it. One corner down...but oh, so many to go. I also got a chance to hang up my final two pieces of Stinky's art work. Now that he's in college, I doubt I'm going to get anything new. 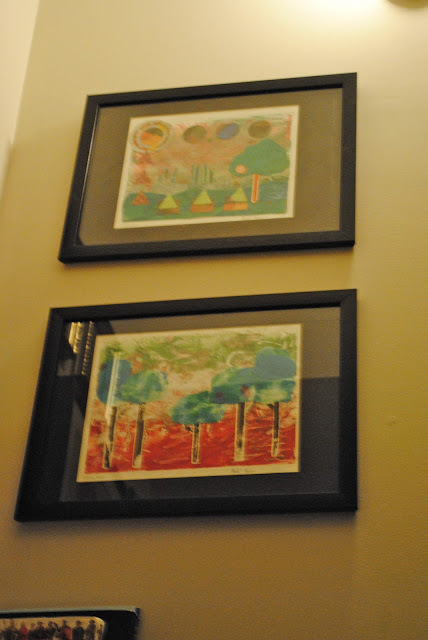 I think Ryan's going to have to start giving Oma some of his art projects to fill up the rest of the wall. Have you organized anything lately? Cleaned up an area in your life? I'd love to know if January does it to you too. I am working on my atrocious sewing room. My fabric was so disorganized I couldn't stand it; it was in boxes and bins and so difficult to see what I had. I also wanted my customers to be able to shop in there and it wasn't possible. So, after the new year I decided this had to change. My friend came over and put shelves up for me and we organized and got everything out of boxes and bins and OUT. Not quite finished yet but it's getting there! I LOVE my room now! Your crafting area looks great. I always want to reorganize and simplify after Christmas.I'm snow bound so have used this time to clean closets and cabinets, no fun! Great transformation. I have been tackling my basement and getting so much satisfaction out of it. I'm not done yet but I see great progress. BTW, Stinky's drawings are great. Good stuff, Lindalou, but as I look around my office, putting me to shame :( Hopefully, my life will settle down and I can tackle winter indoor projects. Yes, January does do that to me too, but this year I didn't get very far - organized the bills and other paperwork, but not a lot of clean up. painting and tiling the kitchen. But that has been going on forever. Something always needs to get fixed first. Your office looks tidy! How long does it stay like that? Mine goes downhill fast. I don't keep it neat for long. Your recipes look yummy. I will have to try that bechamel sauce now that I am eating dairy again. Rosey...It won't stay tidy very long, but at least I have bins and boxes to put stuff in. Before, I just had things stacked up. Keep your fingers crossed. Your crafting corner looks so inviting...makes me want to start crafting. I even liked how it looked before you did the organizing. Stinky's art is pretty special. Bed, Bath & Beyonce -- ha-ha. I'll probably not be able to get that out of my mind now.